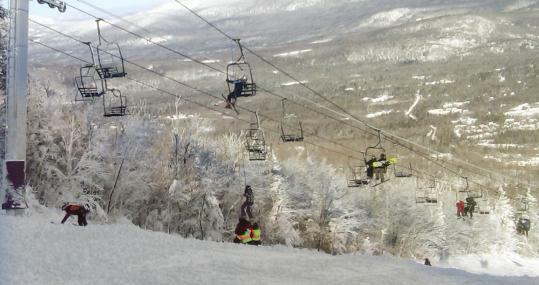 A chairlift at Maine’s tallest ski mountain derailed yesterday, injuring eight people who plummeted 25 feet to the mountain below, resort officials said. The harrowing ordeal left another 150 people stranded on the lift at Sugarloaf Mountain ski resort in Carrabassett Valley, some for as long as two chilling hours, enduring wind gusts of 25 miles per hour or more while rescuers worked to get them down, officials said. The injured skiers were transported to Franklin Memorial Hospital in Farmington, Maine, said Ethan Austin, a spokesman for the resort. None of the injuries were considered life-threatening, officials said. A rope within the Spillway East chairlift, one of 15 on the mountain, somehow derailed from the lift’s eighth tower about 10:30 a.m. while it was taking skiers up the mountain at near full capacity, Austin said. As the rope loosened, about five chairs slammed on the snow-covered ground, while the rest remained suspended in the air, he said. Those left dangling were helped down by the ski patrol, using a pulley system. The cause remains under investigation, Austin said. It was too early to speculate whether heavy winds contributed to the accident, he said. Two other chairlifts at the resort were shut down yesterday because of the winds, but early morning testing indicated that the Spillway East lift was safe, he said. It was the worst derailment at the resort, he said. Two state inspectors were investigating the lift yesterday afternoon. Ben Simms, an 18-year-old senior at Harriton Senior High School in Rosemont, Pa., was on the lift when a chair ahead of him derailed. The chair bounced up and down, he said, beginning an almost two-hour ordeal, in which Simms sat on the lift, very cold and waiting to be rescued. Temperatures hovered in the low 20s, officials said. “They rescued people depending on where on the lift was the coldest,’’ which is higher up, Simms said in a telephone interview, explaining that his car was near the fourth tower. She said the cable fell from the pole a maintenance person was working on and all the cars between that and another pole fell. The lift was manufactured and installed in 1975 and modified in 1983. It carries 162 chairs, each built for two and weighing 140 pounds, and is powered by a 250-horsepower motor, resort officials said in a statement. It is not unusual for a ski lift of that age to still be used, Austin said. The machinery is inspected daily and receives weekly, monthly, and yearly maintenance and testing, as well as an annual inspection by the Maine Board of Elevator and Tramway Safety, he said. Austin told the Associated Press that the lift was slated for upgrades or repairs. The lift will remain closed while officials investigate why it derailed, but other chairlifts are expected to be open today. Martin Finucane of the Globe staff contributed to this report. L. Finch can be reached at lfinch@globe.com; Jeffrey Fish at jfish@globe.com.